A map showing the Pony Express route (red) in western Utah. It shows some of the more prominent station in western Utah. After camping at Utah Lake with my wife Tara for a week; she and I decided to follow the historic Pony Express trail in western Utah. We left Utah lake and drove south on I 15 to east Route 6. Drive on Route 6 through Eureka until you reach 36 north. This road will take you to the Faust pony express station. From here Tara and I drove on the Pony Express into Nevada stopping at each station stop. Remember this is desert country and extremely isolated. Carry a spare and know how to use it. Bring extra water and food dayttime temperatures during the summer can be well into the 100s. DO NOT start this trip without a full tank of gas. 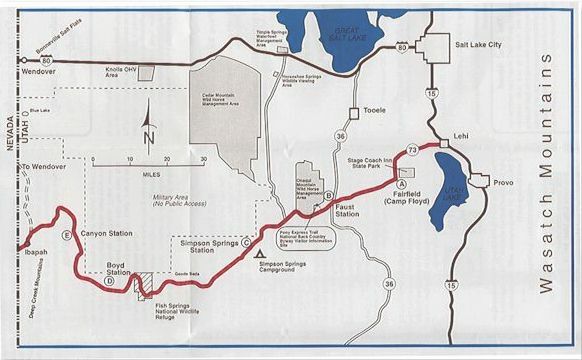 An atlas of Utah (I use the Benchmark Maps Atlas) will show the route and all the stations. On this particular day Tara and I were on dirt roads for over five hours. The towns of Callao and Ibapah have few services so plan according. 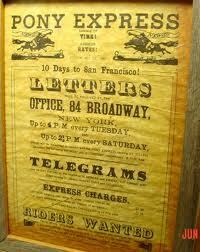 Short history: The Pony Express was founded by William Russell and William Waddell in 1860 to create faster comunications with the west. In the past it used to take approximately six months for a letter to reach California. The mail service began in St. Joseph, Missouri, and ended in Sacramento, California. The men carried saddlebags of mail on ponies between relay stations. Each pony rode at a full gallop for 10-35 miles. 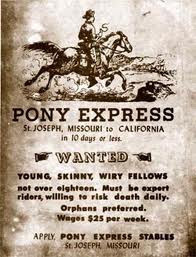 The service opened in April of 1869 with ponies leaving Sacramento and St. Joseph at the same time. First westbound trip 9 days 23 hours; easbound 11 days. At its heighth the service had 100 stations, 80 riders, and 400 to 500 horses. However, the service was never profitable and it ended after 19 months because of the completion of the telegraph. (Thanks to ponyexpress.org for this information). Tara at the Faust station commemerative plaque. The first station we visited on the trip. The monument for the Lookout pass station. Notice the missing station plaque. The station plaques at Rush Valley and Fish Springs stations were also missing. The beautiful commemeration for Simpson Springs at the southern end of the Dugway Proving Grounds. Remains of the Boyd Station near Callao, Utah. The Canon station west of Callao, Utah. I skipped Willow Springs in Callao for this post becuase it was featured in this blog last June. Deep Spring Station site in Ibapah, Utah, right on the Nevada border.